In the autumn 2017 the Churchwardens rounded up a group of volunteers and set about the annual clearup in the Churchyard. Light pruning, much leaf gathering and a lot of good fellowship later, the churchyard looked spruce and tidy. Their labours turned up a displaced grave marker, an unusual object in the form of an iron cross. Not any old cross though, since this one had been specially cast. It bore a set of initials and a year, CJW 1863. Did those initials and date refer to a person listed in the Rothley Church burials register? Sure enough. Charles James Woodbridge, aged 12, was buried on 26th August 1863 and his brother George, aged 7, followed him on 31 August. So who were these two who died so early on in a young life? Perhaps the census can help. What an intriguing set of relationships this reveals. What can we assume from what we see here? Following the appropriate trails we find that Charles John Woodbridge is the child of Giles and Ann Woodbridge (as is George). Giles was born on Charney, Berkshire, in 1821 and no doubt he had gone to London to find work. Their marriage took place in Trinity Church, Marylebone, on 15th December 1847, when Ann was a Palmer. They gave their addresses as Harley Street. Back in the Rothley Church parish registers we see that Ann Palmer was born on the 31st March 1825 to John & Jane Palmer and baptised on 26 Dec 1831. So far it has not been possible to work out how she got to marry Giles Woodbridge in London, but it is most likely she had gone to the capital and was working as a servant. Giles was born at Charney in Berkshire, so he would have made a similar journey into London. But there was a further event that might explain the marriage. Their first child Sophia Woodbridge is imminent. Sophia was baptized on 20 Feb 1848 in Rothley Church. In the 1851 census Giles is shown as a footman, along with a coachman, a cook and a maid in a household at 39 Gloucester Place, Marylebone. The family are not listed as at home on census night. At the same time Ann is listed in the Queen Charlotte's Lying-In Hospital along with their 'male child' (Charles John) of 19 days. Sophia is in Wanlip at that moment, being cared for by Ann's uncle, William Palmer and his wife Mary. Six years later Giles died on 15 January 1857 at No. 11 Dorset Buildings, Marylebone. The death certificate gives Phithisis as the cause, which we would understand as tuberculosis, and his occupation as footman. The death was witnessed and reported by Elizabeth Lusty. The 1861 census table above suggests that their second son George was born the same year 1857, and in Rothley. The birth appears not to have been registered. However, the Baptism register states that George was born on 21 Jul 1856 and baptized on 28 March 1857. Perhaps the pregnant Ann and her Charles John were in Rothley during her confinement, and never returned to London. Living at 25 Woodgate at that time was widower William Boyer with his two sons Frederick and William Boyer. 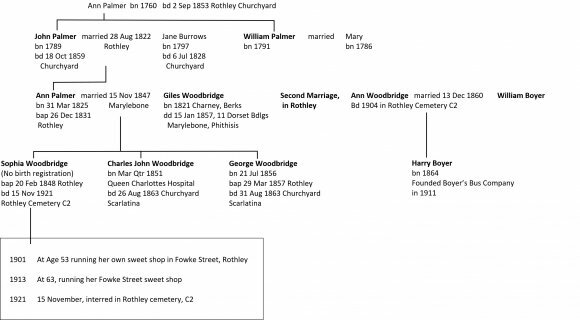 On 3rd December 1860 William Boyer and Ann Woodbridge merged their widowhood and children into a marriage at the parish church. The union was actually productive. In 1864 they were blessed with a child, Harry Boyer. A surprise for the 51 yr old father William. Moving the story on, as recorded in the 1901 census, here is the household created by that Harry Boyer. Harry's mother Ann is being cared for among his family. Ann died at the end of 1904, and was buried in plot C2 in the new parish cemetery, the 20th entry in the register. Harry Boyer developed excellent carpentry and joinery skills and around 1910 set about building bus bodies onto four lorry chassis. He saw the possibility of ending Rothley's relative isolation from Loughborough and Leicester. He formed 'Boyer's Buses' in 1911, eventually handed it on to his son William. As is the way of progress, other more modern operators developed the travel market, and in 1959 William sold the business to The Birmingham and Midlands Omnibus Company, the so called Midland Red. This all started with following the story of those unfortunate young people who died in 1863. That led to their mother, Ann Palmer, who became a Woodbridge then a Boyer, and who brought the noted bus entrepreneur Harry Boyer into the world. 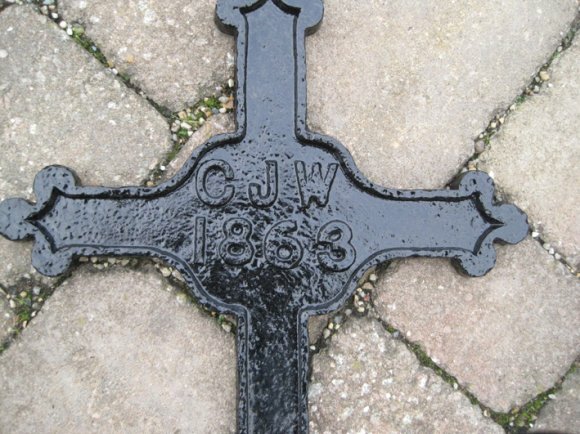 But there is a whole other story arising from the research inspired by that old iron grave marker. Ann & Giles' first child, Sophia, remained unmarried, but found herself in some interesting situations. For a long period, noted by census entries in 1871, 1881 and 1891, she was in the servant household of Susan Emma Smith. Susan was the daughter of Sir James Parker, who bought the Rothley Temple Estate from the Babington executors in 1842. Susan married a leading Barrister, Archibald Smith, and heralded some very accomplished descendants. In February 2018 we are waiting to see where the iron cross will be sited but the information will be added when known. XHTML 1.0 validated. WCAG compliant. Page generated in 0.1774 seconds.